Product Description: Deep within a subterranean Mine-World, a tribe of humans forced into a grim life of servitude by malevolent overlord Zygon knows nothing of the surface world or of hope… until a brave young boy named Orin discovers a sword with mysterious powers that only he can unlock! After escaping the Mine-World with his weapon, Orin teams with rogue smuggler Dagg, a beautiful princess and some trusty robots on an intergalactic mission to free his enslaved people and defeat the evil Zygon. Starchaser is one of my favorite action packed animated films from the 80's. I was super excited to learn that Fries Film Group was bringing this to Blu-ray. I never understood why this film never got the Blu-ray treatment it deserved. Now thankfully through Fries Film Group, this is a wonderful Blu-ray to own. They do an amazing job in capturing this great film, bringing it to a new audience on a new high-quality transfer, high definition. I am a super fan of classic 80’s animation and StarChaser is a prime example of those 80’s animated beauties. This also is being released on DVD by the same company. The Blu-ray comes with a wonderful 3D Lenticular cover. In a sense this plays out like a perfect Drive-In B-grade adventure. It’s an animated film that should be seen, and respected for giving fun, animated entertainment. Space, swords, aliens what more could anyone want. What makes this animated movie stand out as being unique and one of a kind is it was one of the first animated films that took both traditional animation and mixed computer animation and placed them together. Also making it stand out, it was one of the first to be released in 3D. Directed and produced by Steven Hahn, and written by Jeffrey Scott, both captured a wonderful trip of imagination and adventure. Both created a memorable animated film that plays with the child like imagination within us all. I remember seeing this when I was a we little child in the 80’s and falling in love with it. 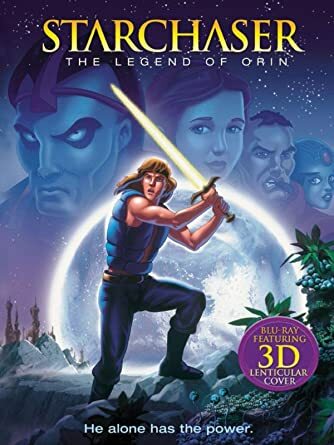 If I remember right it was one of my first VHS’s I watched with my Grandma while being babysitted. So, it brings back fond memories. Jeffrey Scott is a solid writer of countless animated features from TV to feature film. I grew up watching his amazing animated writing. He has been involved in so many features from my childhood. StarChaser is a prime example of his brilliance, but he also captured other 70’s, 80’s and 90’s classic television animation such as Challenge of the Superfriends, Captain Caveman and the Teen Angels, Mask, The Littles, Captain N, Duck Tales, Talespin, Muppet Babies and so many other classic animation TV series. He was a pivotal part of my childhood growing up. It was amazing seeing StarChaser again. It was amazing seeing it on this top quality, High Definition Blu-ray. This is a Blu-ray I highly recommend. I would have loved to experience some special features, at least a couple extras, but sadly that is the only down fall to this Blu-ray. It would have benefited with Special Features, specifically for the fan. But with that said this is an amazing Blu-ray put out by Fries Film Group. Another beautiful example of treating an older animated film and bringing it out on a wonderful High Definition reality. The audio is fantastic. Sounds amazing. The video animation is vibrant and colorful. Both audio and video are crisp to sight and sound. High Definition for the first time. English Stereo Sound with optional English Subtitles. This Blu-ray is a must own, must experience reality. Fries Film Group went above and beyond in capturing a new outlet for this Drive-in animated classic. A brilliant special edition that is worthy to be talked about and praised. Great product. Truly a must own experience. It brought back the childhood imagination in a wonderful trip of space, aliens and the aspects of good and evil. StarChaser is a Blu-ray that shines and is a perfected experience. A beautiful transfer. Awesome audio and video equal a Golden Ticket of perfection.